The other day I got to do one of the most satisfying things of my job: go hang out and collaborate with a bunch of CoachAccountable users, specifically ones who are keen to use our online coaching platform to support a sizeable undertaking. I first made the acquaintance of Patrick Howe in the fall of 2016, when he reached out to explore if CoachAccountable would be a good fit for his Spotlight Coaching Academy, a program to support and train the sales teams of one of Comcast’s internal divisions. Five months later, after a bevy of calls and due diligence measures, they were all signed up and off to the races (them’s corporate sales, amiright? :). Patrick and his team for this year are putting together a new business coaching program for training Account Executives in the Comcast way of doing things. They’ve designed a year-long program to onboard and get up to speed their incoming Associate Account Executives, and a 3 month program for more seasoned professionals coming into the company. 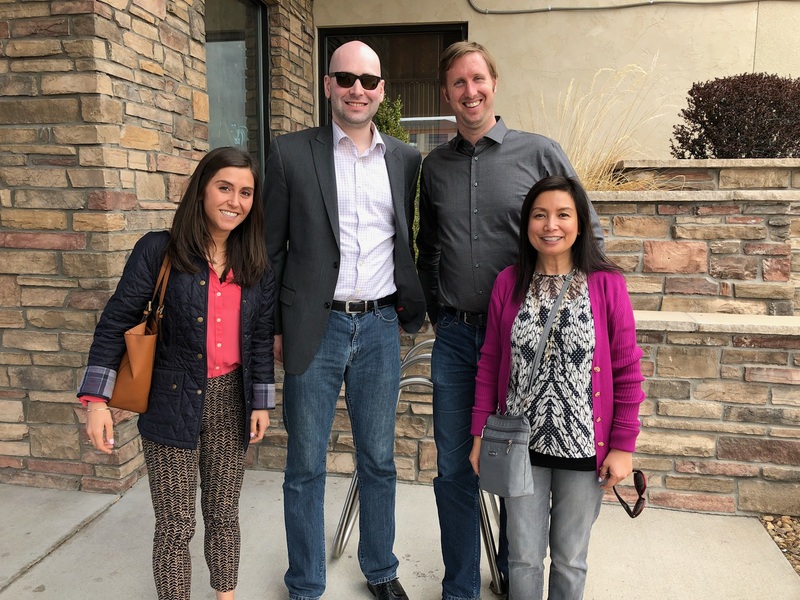 Patrick and his team came this week to Denver for a team summit. When Anna realized that that’s where I am she invited me to join the gang for a little powwow session on how to best leverage CA for their programs. I was all too happy to oblige. I can do this sort of thing virtually in webinar style, but man, it’s so much more fun in person! So on Thursday we hung out. In the conference room, lots’a whiteboards, CoachAccountable projected on to the big screen from Anna’s laptop. 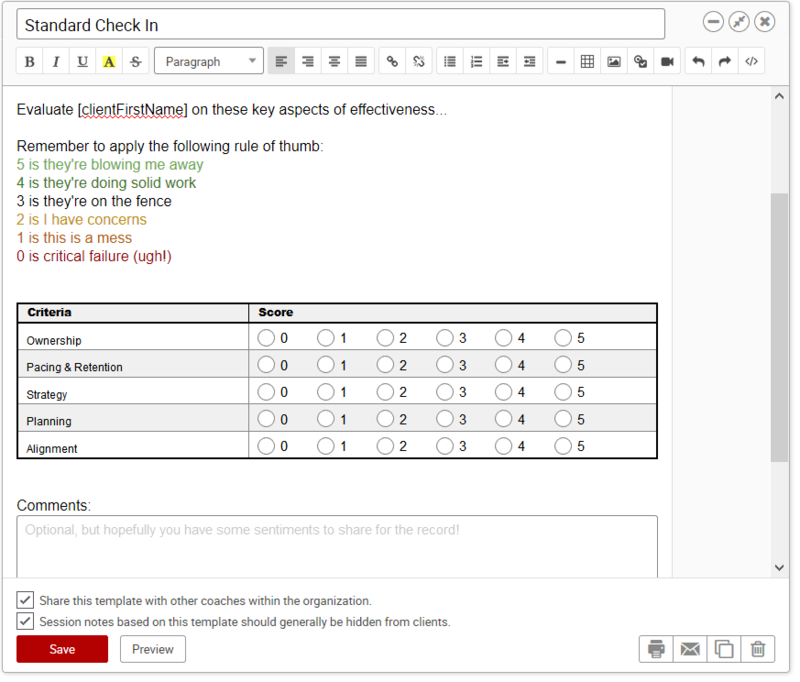 They acquainted me with a 20-point rubric of competencies that were important for program participants to work on and be measured for, and a Session Template within CA that Anna had created within our coaching software to support this. It was a good starting point an made clear the gist of what they were going for. General discussion around the table went more or less to “That sounds great, let’s put this as an action item for us to do and get these things back to John so he can do this.” A very reasonable and sensible tack to get things going. A simple, standard, 5 point scale with a clear description of what each number means. The key criteria are a bit terse but packed with meaning within the context of their program and methodology. It’s deliberately visually tidy, specifically laid out so that one could eyeball this filled out and know instantly whether things were going well or there were issues. This should help when reviewing past sessions as well as to allow quick filling out with minimal distraction from the actual coaching. Five metrics in total, but you get the gist. Note that a “3” is the dividing line between good and not so good, consistent with the standard set in the Session Template. This was about 18 minutes well spent: with it they had a nice structure by which to assess and record key things swiftly during their calls and in a way that will be uniform across the coaching team, giving data that will be readily reported and exported for their use in assessments. Pop into the coaching dashboard and review where the person you’re about to talk to is at: check on the Actions they said they would do, review the notes from the last session or two, eyeball the Metrics. Your whole prep done in 2-5 minutes. Call them when it’s time and load up that session template for note taking during the call. 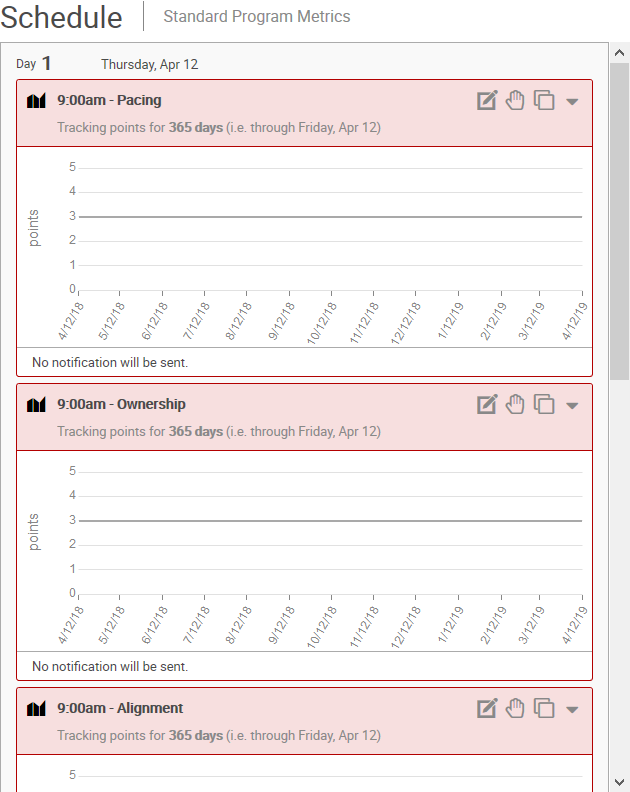 Check in on outstanding Actions from last time, mark done what’s done, cancel or reschedule incomplete items as fitting. Add in any new Action items they’re committing to between now and the next time you talk. After the call add in any other observations to the Session Notes and mark ’em complete. Done, on to the next person! From there we went to lunch. We enjoyed talk of travel and business, good food, and the good show that our hibachi chef put on at the Japanese steakhouse. My thanks to the Comcast Spotlight team for inviting me out for both the powwow and to lunch, that was super fun! Would you love to have a visit from CoachAccountable or visit us? Drop us a line! And, if you’d like to check out the product that makes these relationships so special, start with your free 30-day trial.